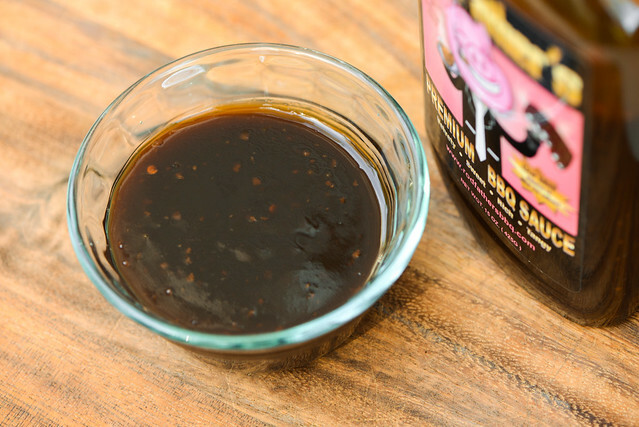 A strong molasses and sugar base define this premium sauce, which has a nice ubiquitous barbecue complexity from vinegar, Worcestershire, garlic, onion, and a faint liquid smoke that all sit just below its sweet surface. 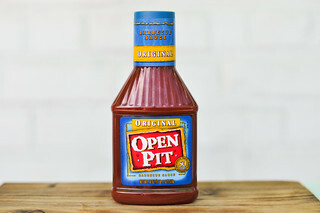 This sauce was generously sent to me by Rod Wallenbeck, the pitmaster behind RodFather's BBQ. While I don't know much about the background, what I can ascertain from the bottle and website is that RodFather's is produced out of Camillus, in the Syracuse area of upstate New York. Rob developed the sauce with a focus on making it a premium product, and it's currently available in a number of stores around Syracuse and online. A first whiff of this sauce makes it abundantly clear that it's hitting the molasses hard. The deep, sweet aroma dominates, with a moderate tanginess giving it some balance. Behind the molasses, there's a sweet tomato ketchup and Worcestershire, which give the sauce a very ubiquitous barbecue profile. These standard set of ingredients are strong, but with additional nasal inspection, I was able to pick up light fragrances of onion, garlic, pepper, and smoke. RodFather's is a smooth, dark maroon sauce with a glossy finish. It's semi-transparent, which makes it easy to see the large spice specs that look like they could be bits of garlic and pepper flakes. It sits right below medium on the thickness scale and has a consistency very similar to a slightly thinned molasses. This has the sauce falling in a quick, steady, syrupy stream off a suspended spoon, which ends with few fast final drips, and leaves a thin, transparent coating left clinging to the silverware. A blast of sugar greats you on first taste of this sauce. It begins as a straight up sweetness, but molasses comes in pretty quickly to add substantialness to the flavor. 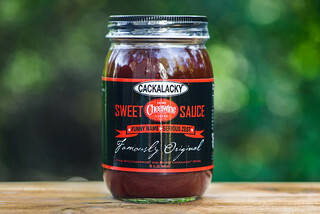 That strong sugary profile persists from start to finish, but as the sauce settles on the tongue, it first gains a very ketchup-y tomato flavor, followed by a tanginess and added complexity distinctly from Worcestershire. The bits of spice floating in the sauce do seem be garlic, as they add a slight bite and crunch right before a mellow heat makes an appearance at the end. This leaves the final flavor as a nicely balanced sugary molasses with contrasting heat and tang. 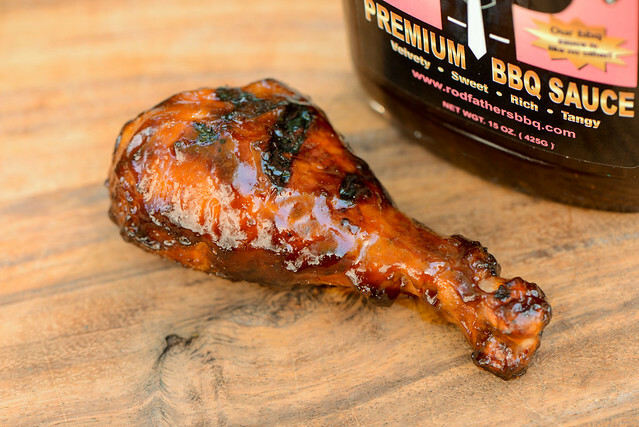 The sauce brushed onto the chicken leg in a thin, even coating. It baked down very well over indirect heat, then developed attractive caramelization over direct heat without burning. The flavor tasted fairly similar to out of the jar, but with an amped up sweetness. This made the molasses more pronounced and forced the little bit of heat into submission. The tomato and vinegar remained good partners with sugar, and the three were especially great in those bits of concentrated caramelization. 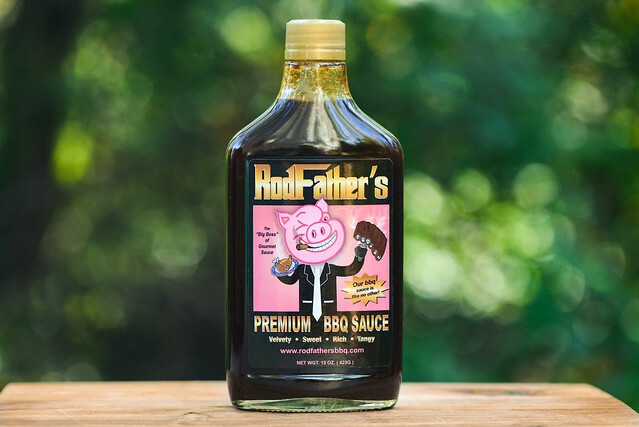 RodFather's brands itself as a "Premium BBQ Sauce" and in way you can totally taste that—it is certainly made up of quality ingredients compared to what you would normally pull off the shelf. On the other hand, its heavy dependence on sugar and molasses masks some of the other good stuff going on beyond the surface. 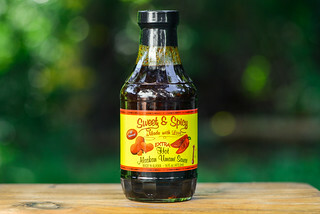 You can get the complexity from the vinegar, Worcestershire, garlic, onion, smoke, and pepper but you also can't ever escape the strong hold of sweetness. Put to use, I think it would be best paired with items with a rub that can contrast the sugars, making it well suited for items like ribs or pork butts more than unseasoned chicken and the like—although I must say my chicken leg wasn't too shabby on its own, but a little spicy rub would have made it all the better.